Kathy Tyers was born in Long Beach, California in 1952. She was the first child of Dr. H.C. Moore, an accomplished dentist and jazz musician who had served during WWII as a test pilot, and Barbara Putnam Moore, flutist with several California orchestras. Kathy attended Montana State University in Bozeman, where she received a degree in microbiology, married, performed widely on her flute, and then became certified as a K-12 classroom teacher. After teaching primary grades for three years, she retired to start a family. Her only son took long naps and enjoyed playing alone, so in 1983 she set her electric typewriter on her kitchen table and started writing a book. Shortly after finishing the first draft, she joined a writers group, where she learned to critique and self-edit. First novel FIREBIRD was published by Bantam Spectra books in 1987, followed by FUSION FIRE, CRYSTAL WITNESS, and SHIVERING WORLD. In 1993, her Bantam Spectra editor asked if she’d like to be a Star Wars © writer. THE TRUCE AT BAKURA hit the bestseller list, and life got hectic, exciting, and generally crazy for a while. After one more novel for Bantam Spectra (ONE MIND’S EYE), Kathy took a sabbatical to deal with family issues. Targeting the Christian Booksellers Association market, she attended several writers conferences before concluding that no CBA publisher was interested in science fiction. She made three attempts to write a contemporary women’s novel, then turned back to her secret passion, which was to revive the unfinished FIREBIRD series. A year later, she connected with Steve Laube of Bethany House Publishers. Laube, a science fiction fan, was willing to take a risk on the project. 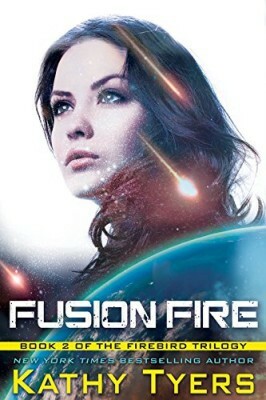 Rewritten to enhance their underlying spiritual themes, FIREBIRD and FUSION FIRE reappeared in 1999 and 2000, followed in 2000 by a third Firebird novel, CROWN OF FIRE. Meanwhile, the call to write Star Wars came again, this time from Del Rey Books. NEW JEDI ORDER: BALANCE POINT was also a 2000 release. In 2001, Kathy received the Mount Hermon Christian Writers Conference’s Pacesetter award for her efforts in the growing Christian science fiction genre. However, during the years that followed, worsening family troubles forced another sabbatical. Another SF novel was started but shelved. Bethany House asked for a new edition of SHIVERING WORLD, which Kathy completed while working at a retail greenhouse. Kathy was widowed in 2004 and returned to school in 2006. Also in 2006, she worked with classical guitarist Christopher Parkening on his autobiography, GRACE LIKE A RIVER. In 2008, she received a Diploma of Christian Studies from Regent College in Vancouver, BC. In 2009, she completed her Master of Christian Studies and returned to the United States. She spent a year in Bellingham, Washington and then moved back home to Montana, where she remarried in October 2014. Kathy is currently working on a science fiction novel and a contemporary fantasy while assisting other writers as a freelance editor and mentor.